VyprVPN is one of the stronger VPN services out there due to the high number of locations available, good infrastructure, great speeds and features. Add a trusted company operating the service and a three day free trial and you have a clear recipe for success. We would like to see them accepting bitcoin in the future and maybe adjust their prices to the market, but those are minor details compared to the positive aspects. VyprVPN is a service owned by the Golden Frog Company, incorporated in Switzerland, a main partner of Giganews – one of the largest usenet providers. They also provide a secure cloud storage service, Dump Truck. VyprVPN hosts their 700+ VPN servers in Europe, North America, Asia, South America and Oceania and they do provide unlimited access to each and every one of those servers, so there’s no traffic or bandwidth limitations what-so-ever. One thing that stands out is the fact that they own the server infrastructure so they don’t rely on third parties for hosting the server clusters. 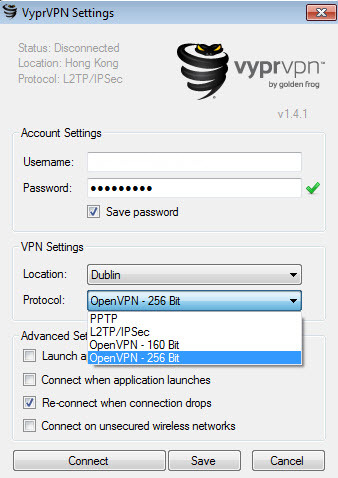 VPN protocols: PPTP, L2TP/IPSEC and OpenVPN, although the latter two are only available for the “Pro” plans. OpenVPN is available with two encryption ciphers: 128-bit BF-CBC and 256-bit AES-CBC. Both of them use UDP, port 1194 and 443 for the later. Using all three major protocols for connectivity, they cover most but-all important devices and platforms. VyprVPN will work on Windows, Mac OS X, Linux, iOS, Android, DD-WRT. As a bonus, all users get up to 50 GBytes of free cloud-based storage on the DumpTruck service that Golden Frog provides. This is a pretty nifty service, with it’s own app (mobile and desktop versions are available) that allows file-based sync trough different devices. 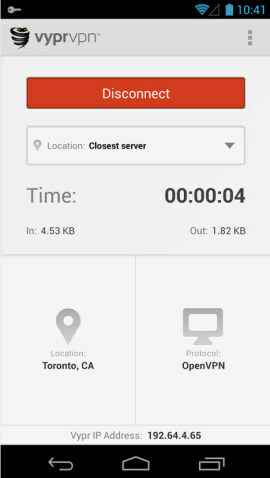 VyprVPN uses a custom connection software, called VyprrVPN-Desktop and VyprVPN-Mobile, for the mobile counterpart. Both clients are clean, fast and easy to use. They allow connections through all three protocols. It is available for Windows, Mac, iOS and Android. Their VPN client allows fast switching between VPN locations and protocols from a drop-down menu. They offer three different plans, starting with $9.99 / month, $14.99 and $19.99 / month respectively, but you can get almost half-off those prices if you chose to buy the yearly subscriptions. 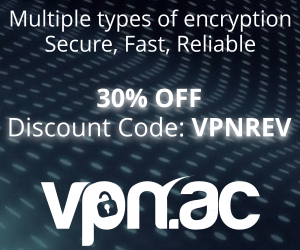 You get 1 connection over PPTP for the cheapest plan while the medium-price plan and the $19.99 one gives you 2 or 3 simultaneous connections over all three protocols (PPTP, L2TP/IPSec, OpenVPN). The latter 2 plans includes a NAT firewall and 25 GB and 50 GB respectively of cloud storage on the “Dump Truck” service. Payment options: All major cards and PayPal are accepted and they provide a free trial for 3 days if you want to test before you buy. BUT they don’t collect any traffic data, perform DPI or discriminate against devices or platforms as VyprVPN is “network neutral”. Golden Frog cooperates fully with law enforcement agencies, yet there must still be a subpoena before Golden Frog provides a member’s identifying information – minimal information reasonably calculated to identify and no more. In a criminal investigation Golden Frog is required by the Law to not divulge the fact of the investigation to the member. While we admit that it is a clever trick, in our opinion the disadvantages are overriding the advantages. 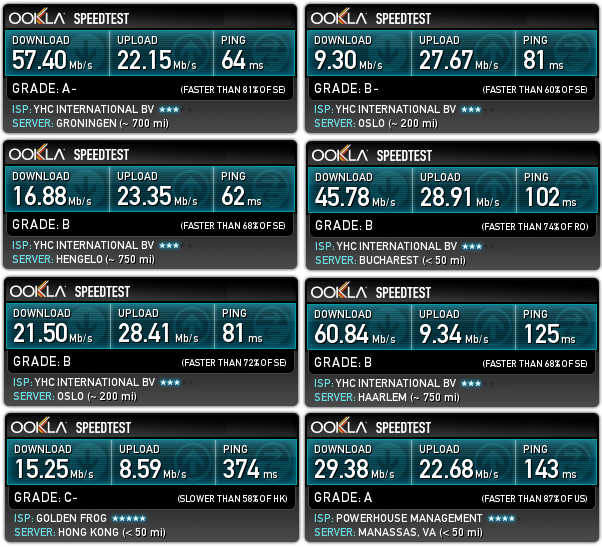 As you can see, speeds are very good and we achieved a consistent download speed of over 6 MB/sec with Bit Torrent. You get tons of multi-language setup instructions, for various platforms, including exotics such as Chromebooks and Synology NAS, Live Chat and a Contact form. On their contact page they state that it takes 15 minutes to receive a reply from their team. We contacted the support representatives and they replied in 6 minutes, so they keep up to their word. VyprVPN is a very solid provider. While there are some things we don’t like that much about their service, overall we believe that it’s a great value for the money. It’s not the cheapest one you can find, but it is one of the few “Premium” VPN services available these days. We give VyprVPN a rating of 7.5/10. 2 months user here. Pricey? yes. But they deliver! I’ve been trying to connect to vyprvpn servers on Chromebook and it just doesn’t work. tried it and simply can’t agree with this review. The drops ALOT, the software is VERY quirky on a mac, says it connected (makes the sound but the login screen doesn’t change). if you close the program down completely or boot your computer without the software running at all it runs, connecting to various things like succentric.com and goldenfrog.com and lots of other calls (while the program is closed!!) You cannot terminate the program either, once its installed its running int the background which is HIGHLY suspicious, like they are using everyone’s computers as IP’s, or connection points, no wonder they have so many. When you try to ask them questions, they are met with blank stares in the live support chat and email tickets, no answers….not technical clarity anyway. I recommend staying away from them until they can paint a clearer picture of what is going on. 3. Four tickets and a month later the issue is still not resolved and it’s now even that bad that there application won’t launch and I can not uninstall it either. 4. Once in a while they might contact you asking whether you still have a problem. I gave up, they won’t refund my money, because that is in their terms in conditions and it looks like no where is mentioned that you need to provide a workable service. I will just say that the same thing happened to me with Golden Frog Software. They are credit card scammers, they give you 3 days and then a small monthly fee. So you think no big deal and then they go ahead without your permission and charge you for a year in advance and add all sorts of other crap on there. When you confront them it’s basically an hour of tuff stuff. I reported them for credit card fraud. Someone filed a more detailed report see below. Do not sign up with Golden Frog. They will never allow you to cancel your account… they just keep charging and charging, month after month. I initially signed up with Golden Frog (www.goldenfrog.com) when I was in China. I could not get their service to work and explicitly instructed them to cancel my account on March 15th, 2011. Since this date I have attempted to cancel my service with them many times by phone and email. Yet, they are still charging my credit card each month. It has been nearly a year of fraudulent charges by this criminal organization. Trust me… you will be very sorry if you sign up with Golden Frog. Stay away from this VPN company !! Don’t trust them, they will log all your information! They can terminate your service at any time and refuse to do any refund! I don’t agree with this article. Worst customer service ever! First, it took me 3 days to resolve a protocol issue, in which time I exchanged over 20 emails with at least 8 different people. None of which seemed to have a single idea of what I was talking about. They seem to have pre-written protocols they keep sending, even thought it had nothing to do with the problems I had. I am in China and now their connection locations stop being available after a few connections. I reported the issue and they are giving me instructions from my previous problem. Bravo! I hope I can get my money back because all of this is just a big bad joke. Not sure about whether to go for VyperVPN. Their speeds and stability from Europe seem good ( http://www.vpngids.nl/reviews/vyprvpn-vpn-provider/ ), but reviews are more sceptic. I just want to mentioned along with this great review, the company is great, I have been with them since 3 years ago, I mainly use them to surf the internet, watching YouTube and of course I trust them when it come to their NAT Firewall For Additional Security which make me feel ease and comfortable with them. They are great as my experience with them has been great, Just lately I noticed drop in the connection speed, they I’m connection to their Swedish Servers. Other than that hope we can have more speed connection for their customers in Middle East. Kodus to them. I have just wasted 1 hour trying to sign up with VyperVpn. They keep requesting information via email support team, even after authorzing my credit card and 5 emails I still have no service. Been with Vipervpn for some years now on their premium service, (not sure exactly how many years, because I drink too much). All I use is the vpn so it’s all I can address, but I’ve been very happy with the service since day one. Very reliable, always expanding their server base, and no problems for me at all. jmho, but I like them. They keep log files of traffic. Better off using your home network provider if they are tracking your downloads. It a vpn serivice and privacy is what you pay for but do not get. I’ve been a user for over a year and the service has degraded badly. I run this software on three different Windows7 machines and I see the same pattern on each: about six months ago the service continually drops your internet connection after a period of time – could be a few minutes, could be a few hours, but it’s going to happen. I used to get “Time Connected” times of multi-week sessions — WEEKS! though now I can’t even go a day. Remember, this isn’t an ISP problem because every time I Disconnect from VyprVPN my connectivity is restored. I bought in on the company’s ethics but I’m almost out of patience with their support and these problems are so very obviously their problems to solve. I’m giving support one more shot but I’ve cancelled my yearly auto-renew and will go to another service soon if they can’t turn the ship around. I hope they do.